First of all, let's just ignore the color contrast of following pictures. It takes me so long to captured and edited all pictures for this review. I don't know why but body product especially those with a soft color packaging is so hard to capture. It's always over exposure and the color is not as vibrant as the real color. I told you thousands times that I love to include something that smells good into my shower routine. Shower time, especially at night, is an escape way from a tiring day in my opinion. That's why, I am so happy when I found a package of The Body Shop Virgin Mojito on my work desk. Virgin Mojito is a limited edition collection for this summer. This collection has actually been launched since May, if I am not wrong. But of course due to our regulation, it takes longer for these product to entered The Body Shop Indonesia. The Body Shop Virgin Mojito collection is a big range including shower gel, body scrub, body butter, body sorbet, and also body splash. The package I got is The Virgin Mojito Premium Gift Collection. In this gift collection I get a shower gel (250 ml), a body scrub (50 ml) , a body butter (50 ml) and also a mini-green-shower-puff along with a cocktail mixer labeled with The Body Shop logo. They said that the cocktail mixer is just a props and not for making cocktails. I just think it's so creative and worth to be mentioned. I tried to find this gift set on The Body Shop Indonesia website, but I can't find it. I'll check that to the counter and make sure if this specific set is available or not in here. Will update you later. You can still check out this collection also the price details here. All of the product I am going to review afterwards in this post obviously have the same scents. Virgin Mojito just like the name it smells purely like a lime cocktail. The Body Shop explains that Virgin Mojito blends the extract of zesty lime and mint, to create cooling refreshment for your skin. The scents is not overpowering. It didn't give you a cooling effect but It's somehow so refreshing. The scents manipulate my sense of smells and send signal to my brain that make me feel like I am having a shower at a lime forest. It's so far the most refreshing body care I've ever tried. Unfortunately the scents fading away once I step out from the shower. Even thought you layered multiple product from the same line, the scents doesn't last long. Among the three product of Virgin Mojito Premium Gift Set, the shower gel is the one with softest scents. The texture is just like the normal Body Shop shower gel which have the consistency of fluid and feels watery on skins. It's recommended to be use along with a bath puff. I don't like to use The Body Shop shower gel without the puff because it doesn't produce enough foam. 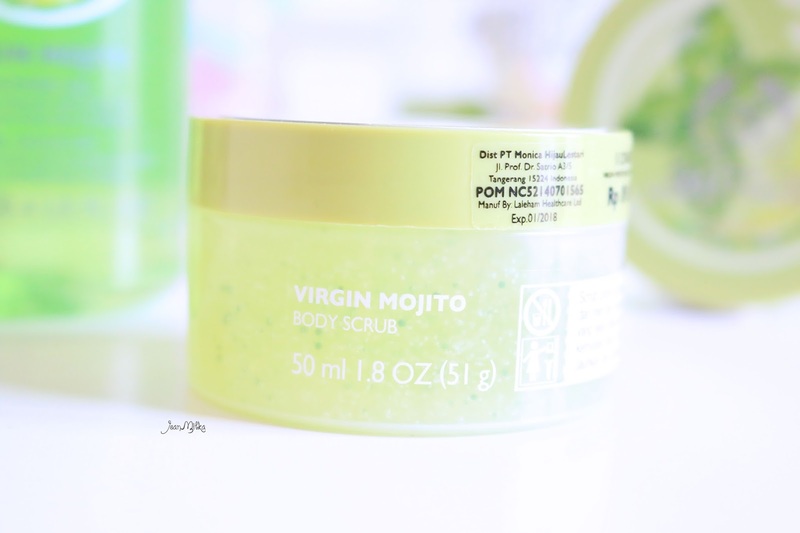 This is my favorite product from Virgin Mojito Collection. 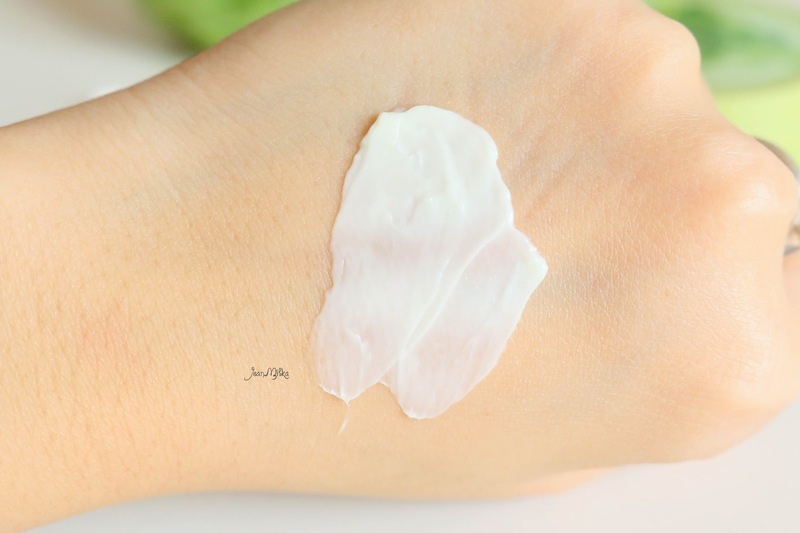 The texture is more like a clear gel with gentle exfoliator beads. This type of scrub could be use for everyday. I didn't feel any harsh on my skin. Sadly, I finished it up so quick tho, maybe because it's transparent and I might scoop more products than I need. However I'll still grab the full size product (250 ml) of this scrub because I really love it. It makes me feel fresh and calm. Last one from this gift set is a body butter. The body shop is very well known for their body butter. I don't really like the sticky feeling of body butter on my skin. 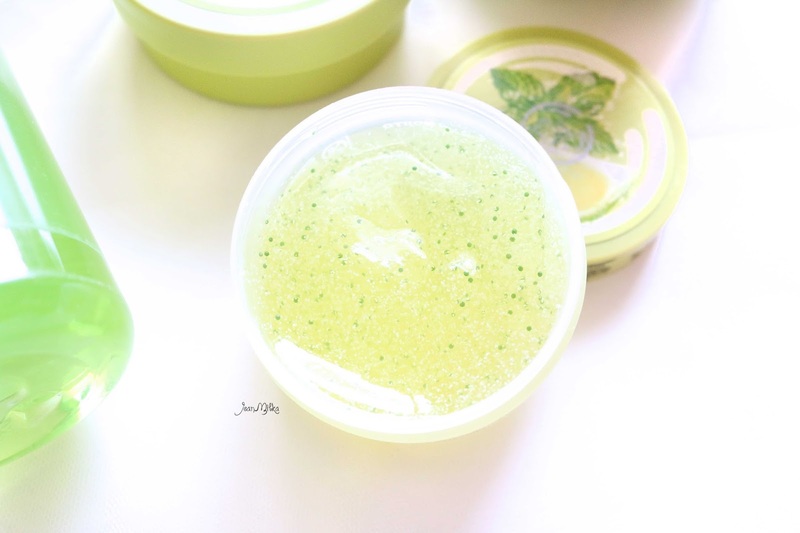 Virgin Mojito body butter is actually not too sticky, compare to the last body butter I tried which comes from The Body Shop Moringa collection. But still I can't stand any stickiness at all. So I only wear it twice a week at the night when I feel like I need extra moisture. Instead of the body butter, I prefer the body sorbet. 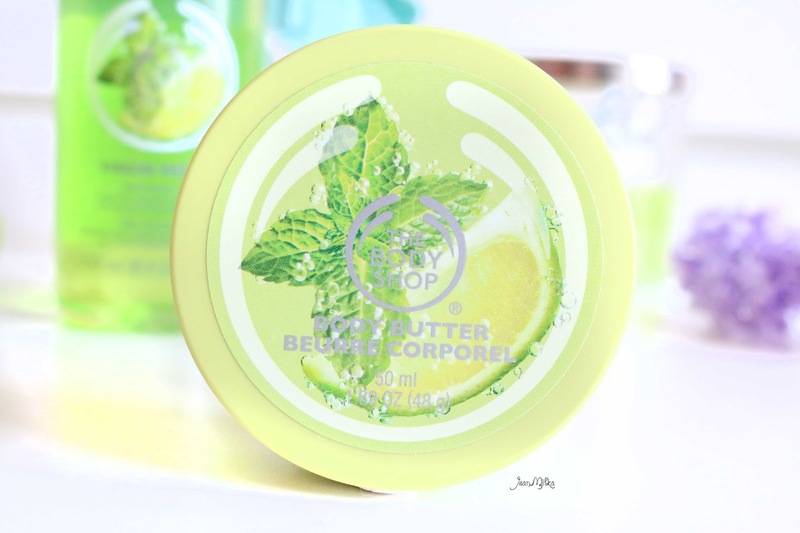 Next time I visit The Body Shop counter, Virgin Mojito body scrub and the body sorbet is definitely my top wish list. 4 komentar on "Limited Edition : The Body Shop Virgin Mojito Collection "
seger bgd liat warna packagingnya yaaa.. seperti menggoda untuk mencobanya hahaha..
Iya. Wanginya juga segar banget. Sayangnya ini itu Limited Edition.